As we all watched in sheer horror and disbelief at the holocaust visited on Gaza during the months of December 2008 and January 2009, one thing became painfully clear. 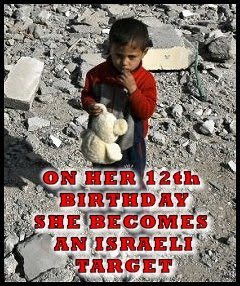 Israel targets children and they are guilty of War Crimes. In fact, they have already admitted this and I will cover their admission in this blog post. There’s just no getting away from this, the numbers don’t lie, neither did our television screens, or newspapers as we saw the Zionist grim reapers handiwork. Despite Israel’s massive attempts to censor journalists and the media, many brave souls persisted and managed to get the truth out. No, the IDF has a “policy”to kill children, and we will learn all about that today. For surely way back in 2000 there was an insightful interview done with an IDF sharpshooter soldier. He spilled the beans to the world. Sorry, but I had to put in two notes below out of nothing more than outrage. Note that Q=Question and A=Answer, read on. Q=But nonetheless there are children who were hit, wounded or killed after they were hit in the head. Unless these were mistakes. Q=“You don’t shoot a child who is 12 or younger.”That is, a child of 12 or older is allowed? Q=Again: Twelve and up you’re allowed to shoot children. Q=Under international law, a child is defined as someone up to the age of 18. Q=So, according to the IDF, it is 12? Q=I want to persist in the matter of the 12-year-olds. Why was this age set? Ok did you get that? First, we have to get past the UTTER INSANITY that the IDF tell their soldiers to kill 12 year olds and they only have to “guess” their age!! If you have children in Gaza pray they remain very short, because if they are 8 or 9 years old, and tall for their age, they are targets. And then consider the intelligence of this IDF sharpshooter soldier, I say, shaking my head in disbelief!! To everyone reading this, if you know a 12 year old, or have a 12 year old yourself, would you consider them to be an adult? Are they legitimate targets in war? If the answer is “no” about your own 12 year old, then that has to apply to every 12 year old in the world, including the Muslim ones. Note however, that the worldwide definition of a child is someone under the age of 18 (except in Israel of course, afterall, they never have to comply with the laws of the rest of the world do they!) 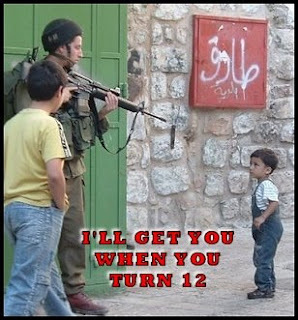 I wonder if the Israeli army considers their own 12 year old children to be legitimate targets for Hamas? Hmmmmmm??? I think not! Double standards anyone? Smell the “hasbara” in the air? And the rule is, the IDF only have to “agree” among themselves that they “think” a child is 12 years old to shoot them. The cartoon below sums this policy up quite nicely! Oh, but there is more, I just can’t leave this article without including another intelligent quote from our brave child killing soldier. What does he think about wounding Palestinians as opposed to killing them? You’re gonna love this one! Q=So why kill, why not just injure? He just said that if you hit someone with a bullet they will scream and say it "hurts" Oh dear, dear, and this is his logic for not wounding people but rather killing them????? Because if you just outright kill them they don't scream "it hurts?" These people are sick. Nice work Israel!! Proves you are the genocidal maniacs the world now think you are! More from Haaretz by Gideon Levy, again, there is a pattern here!! 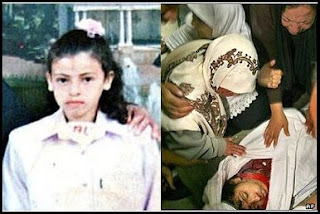 More than 30 Palestinian children were killed in the first two weeks of Operation Days of Penitence in the Gaza Strip. It’s no wonder that many people term such wholesale killing of children “terror.” According to B’Tselem, the human rights organization, even before the current operation in Gaza, 557 Palestinian minors (below the age of 18) were killed, compared to 110 Israeli minors. Palestinian human rights groups speak of even higher numbers: 598 Palestinian children killed (up to age 17), according to the Palestinian Human Rights Monitoring Group, and 828 killed (up to age 18) according to the Red Crescent. Take note of the ages, too. According to B’Tselem, whose data are updated until about a month ago, 42 of the children who have been killed were 10; 20 were seven; and eight were two years old when they died. The youngest victims are 13 newborn infants who died at checkpoints during birth. Israel is creating dead babies and dead children everywhere, they are ruthless killers and show as much remorse as Hitler. Moving on to 2005, report from the UN, do we see a pattern here perhaps, Deja Vu? So, the interview with the IDF soldier proves without a doubt that Israel does target children and is encouraged to do so. This is a war crime. In addition, there is clearly a long standing pattern dating from back in 2000, of Israel not only targeting children, but targeting Palestinians with death instead of wounding. 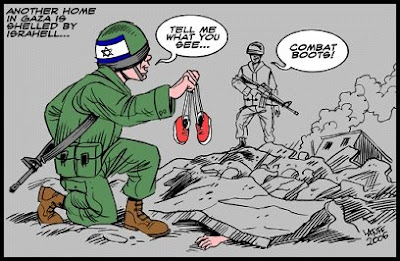 I have wondered if the interview the IDF soldier gave could be used in a court as War Crimes evidence against the army targeting children. As the IDF clearly states, and the sharpshooter clearly stated, anyone aged 12 is a legitimate target, and you only have to guess their age to kill them. However, as the worldwide legal definition of a child is someone under 18 years of age, hence Israel is committing war crimes and this soldier confessed that in his interview. Israel does this with money from American tax payers given over to Israel by the American government. If you are American and don’t want to fund the next round of genocide Israel is planning, then do something about it, do it for yourself, do it for your children, do it for all 12 year olds in the world, and do it for your conscience.